G.Q. Zhang, L.J. Ernst, O. de Saint Leger, eds. 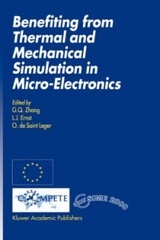 Benefiting from Thermal and Mechanical Simulation in Micro-Electronics presents papers from the first international conference on this topic, EuroSimE2000. For the first time, people from the electronics industry, research institutes, software companies and universities joined together to discuss present and possible future thermal and mechanical related problems and challenges in micro-electronics; the state-of-the-art methodologies for thermal & mechanical simulation and optimization of micro-electronics; and the perspectives of future simulation and optimization methodology development. Benefiting from Thermal and Mechanical Simulation in Micro-Electronics is suitable for students at graduate level and beyond, and for researchers, designers and specialists in the fields of microelectronics and mechanics. Simulation overview in the industry; B. Schwarz. Thermal & mechanical problems in microelectronics; O.F. Slattery, G. Kelly, J. Greer. Solder material characterization and modelling; S. Wiese, F. Feustel, E. Meusel. Polymer material characterisation and modelling; L.J. Ernst. Generic issues in numerical modeling; S. Pulko. Modeling of vapor pressure during reflow for electronic packages; X.J. Fan. Simulation for fatigue, cracks and delamination; R. Dudek, J. Auersperg, B. Michel. Experimental validation of finite element modeling; D. Vogel, C. Jian, I. De Wolf. Perspectives of non-linear simulation; M.A. Crisfield, A.J. Burton. Simulation-based optimisation in virtual thermo-mechanical prototyping of electronic packages; G.Q. Zhang, H.P. Stehouwer. Thermal fatigue reliability optimisation of Flip-Chip assemblies; B. Vandevelde, E. Beyne. Product and Process Optimization with simulation; D. den Hertog, P. Stehouwer.